Did you know you have lost your gun rights in Alabama if you have been convicted of a Domestic Violence Misdemeanor? Has your pistol permit application or firearm purchase been denied in Alabama? Have you previously been convicted of a Domestic Violence, 3rd degree (misdemeanor) in Alabama? 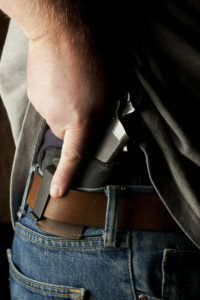 If you have been found guilty or plead guilty to a Domestic Violence misdemeanor or any state felony in Alabama, did you know that not only are you unable to be granted a pistol permit by your Sheriff, you are also prohibited under Alabama and Federal criminal law from possessing or owning a firearm. This includes Domestic Violence misdemeanor convictions in any Municipal or District Court in Alabama. The good news is, if this is your only firearm disability ground, there is a process to seek a restoration of your gun rights under Alabama and Federal law by obtaining a Full Pardon by the proper jurisdiction in Alabama. WARNING: Misdemeanor Crimes of Domestic Violence regarding Alabama and Federal Firearms Prohibitions. Further, said persons are also generally prohibited under Federal law from possessing any firearm or ammunition in interstate or affecting commerce or shipping or transporting any firearm or ammunition in interstate or foreign commerce, or receiving any such firearm or ammunition. Violation of this Federal law prohibition is a federal criminal offense punishable by up to ten (10) years imprisonment (See: 18 USC 922(g)(9) (the Lautenburg Amendment); 18 USC 921(a)(33), 924(a)(2), 925(a)(1), 27 CFR 478.11, 478.32). -the person is otherwise prohibited under by the law of the jurisdiction in which the proceedings were held from receiving or possessing any firearms. -A person who was or had been similarly situated to a spouse, parent, or guardian of the victim.